To exemplify this, we need data regarding the emplacement of the future structure. This data is taken from a geotechnical study over the emplacement soil. - For the layer 4, Loam clay 2: K4.2=tg2(45-21/2)=0.4724. With all this available data we can start to define the automatic generated soil pressure over a wall. We will use a model similar to the one shown in the figure. The structure will be placed under the ground. Before we insert the data about the soil, we must know that the automatically generated planar forces that are produced by the program are created dependent of the local axes of the support structural element. To make sure that these forces are generated correctly it is necessary to place the planar elements of the structure in a certain way. The local axes must be orientated as in the figure: the X-axis along the length of the element and the Z-axis toward the outside of the structure. To generate the soil pressure you must select the structural elements and, from the main menu, open the "Pressure generator" using the "Generate / Load / Pressure..." command. 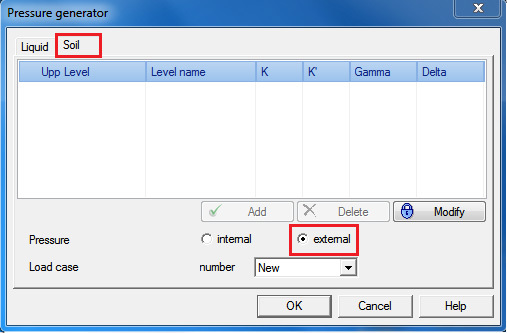 This command will open the "Pressure generator" window. In this window you must select the type of pressure to generate: "Soil". The "Soil Pressure generator" provides the option to chose the direction that the pressure will take action: "Internal" (same direction as the local Z-axis) or "External" (opposite direction to the local Z-axis). In this example, given the way that the local axes of the structural elements are orientated, the appropriate option is "External"
The soil pressure is generated dependent of the soil properties. The soil properties are defined using the "Modify" command and then using "Add". 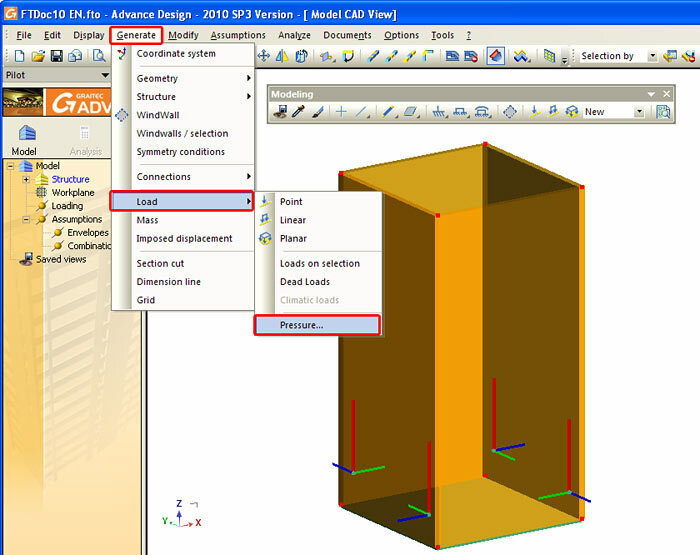 After the soil properties are defined, you must select the load case in which the new generated loads will be included. For this example a new load case was selected. In "Live loads", a new load case named "Pressure" was created.